Knowing what chemicals are in our homes is the best way to start protecting our children from the often unseen dangers of accidental poisonings. 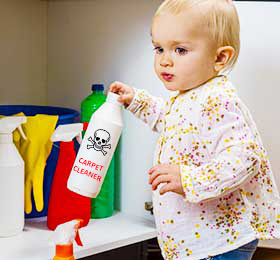 Carpet cleaning chemicals, floor cleaners, fertilizers, anti-freeze, toilet bowl, sink cleaners and even medicines are potential hazards to young children. They’re in our closets and cabinets. They’re in our carpet and on our floors. Let’s learn the best ways to stop children from being exposed to them. With young children it’s always advisable to invest in a set of safety latches. They’re easily obtainable at your local big box home improvement stores. Never keep your cleaning chemicals in the cabinets under the kitchen or bathroom sinks. Children are curious by nature and if they can they will get into these areas. Just remove any dangerous cleaning solutions and store them in the top of your bathroom closet, or in the top of the hardest to reach cabinet in the kitchen. Keep cleaning solutions in their original containers. Never put them into emptied soda bottles or other types of food or drink containers. Never leave an open container of cleaning solution or household chemical sitting out while you’re using it. Keep it secure! Get a locking cabinet for your garage or shed. Keep all of your dangerous chemicals like, weed killers, fertilizers, anti freeze, oils, and sprays secured inside the cabinet. Paints and primers should be kept under lock and key. When using gardening sprays read the instructions and if your child is present while spraying have them wear a respirator. When not in use keep the sprayer locked away. Always check to make sure that the cleaning company you’re hiring is environmentally conscious. If you hire somebody to clean your carpets or maintain your floors think about the chemicals they will be using. After all they will be using them on every square inch of your floors. Most are applied wet and then dry over time. Make sure they’re not harmful to a developing child’s immune systems. Or pregnant mothers unborn child. Most modern carpet cleaning companies use high temperature water with cleaning agents. Will the cleaning agents they use be safe for you children. We spoke to Chris Stinnett of Centric Carpet Cleaning in Lexington KY. When he schedules a floor or carpet cleaning job he always enquires if there are any pregnant women or children in the home with breathing difficulties . The for this is simple. Chris is a father and husband. Having been in the cleaning business all of his life he knows chemicals. And knows how dangerous different cleaning agents can be if not used correctly. Centric Cleaning operates in all of KY and we can recommend them as a Eco Safe Carpet and Floor Cleaning company. If a person is pregnant, has children, or anybody in the home has breathing difficulties. Hire an eco safe company that uses safe chemicals. Hiring a painter is no different. Paints have a lot of volatile organic compounds in them. Some paints can take a full 5 years to gas off and lose their toxicity. If you need an Eco safe Painter in Louisville KY we recommend contacting Don Smitley of BestPro Painters. Don exclusively uses No VOC paints caulks and other methods to keep the air in a home from being toxic. He even has and uses dustless sanding machines. Children love to learn. And it’s never to early to start teaching them about the products in your home. They’re genuinely curious and most everything is new to them. Don’t let them discover the chemicals in your home on their own. Introduce them to the products that you use and explain the dangers of them. Kids aren’t stupid, but they are ignorant to the dangers with chemicals. Help them by teaching them what’s harmful and why.. You can even make a game out of it! So there you are! Having a home that’s chemically safe is not as hard as it sounds. If you don’t get started. You’ll never get there. Car Shopping? Be Smart! Check a Cars Rated MPG Before You Buy It! Be Smart and Check Your Home Energy Use. Our Homes Use Energy Too!